ARC Professor Michael Spurgeon began with informing students that they could sign up for this year’s conference for $95 at Summer Words, a creative writing festival from May 26-29. “Word Soup,” which has been at ARC for the past two and a half years, was originally created by Harold Snider, a faculty member. Every year, “Word Soup” features a faculty member, but this year it was turned into a review of the magazine’s potential stories hosted by their current editor in chief, Eric Vincent. Vincent notified everyone in attendance that the magazine was currently accepting submissions for writing, poetry, and graphic design, hoping to get more people to participate. The college literary magazine is solely a student produced magazine and has won the title for “Best in the Nation” on nine different occasions, making it the only community college in the country to achieve this more than twice. Next was instructor Danny Dyer, who read three short sonnets and seven poems that he wrote. Dyer credits his mood and “the time spent in Alaska” for his inspiration in writing sonnets that were primarily based in nature. Vincent then opened up a question and answer panel where he asked the three guest speakers three random questions, such as to describe their outfit, the last book they touched, and what they last bought at a grocery store. The audience then got the chance to ask the guest speakers some questions on writing, what inspires them, and how’d they knew what to write for certain feelings. When asked what makes a good writer, Dyer said “A writer is defined by writing, if you write, you’re a writer”. 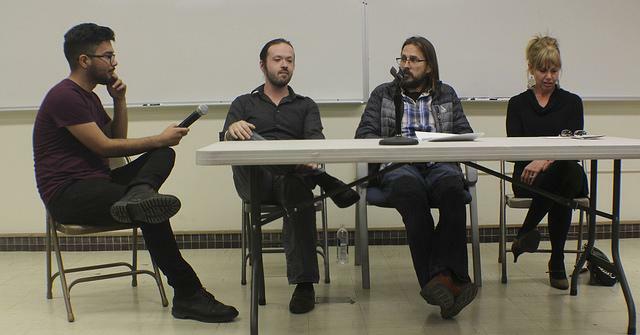 When a student asked about how they deal with writer’s block, Kiefer said “I don’t because don’t get writer’s block,” and the other speakers seemed to agree but gave the advice to keep writing through it. Be the first to comment on "ARC hosts annual review for literary magazine"